It can happen to anyone. One minute you’re on your feet; the next you’re on the ground. Falls are the leading cause of all non-fatal injuries and the most common reason for visits to the emergency room. One in five falls results in a significant injury, such as broken wrists, hips, legs or ankles or head trauma, and falls are also the second leading cause of injury-related deaths behind motor vehicle accidents. Protect your head. Falls are the number-one cause of traumatic brain injury in the United States, accounting for nearly half of these injuries. To help minimize the risk, try to tuck your head toward your chest if falling backward and turn your head to the side if falling forward. Reach and relax. Although it’s natural to tense up, try to stay loose and reach with your arms bent to help cushion your fall. Eliminate clutter. Keep pathways clear by moving furniture or removing throw rugs, toys and otherobstacles in the home as well as tools, hoses and other items outdoors. Focus on safety. Make sure rooms are well lit, and use handrails on stairways and grab bars in the bath or shower. Outdoors, pay attention to the pavement or other surfaces and weather conditions. Even at the market or the mall, watch the flooring, displays and other potential hazards. Check your eyes – and your meds. 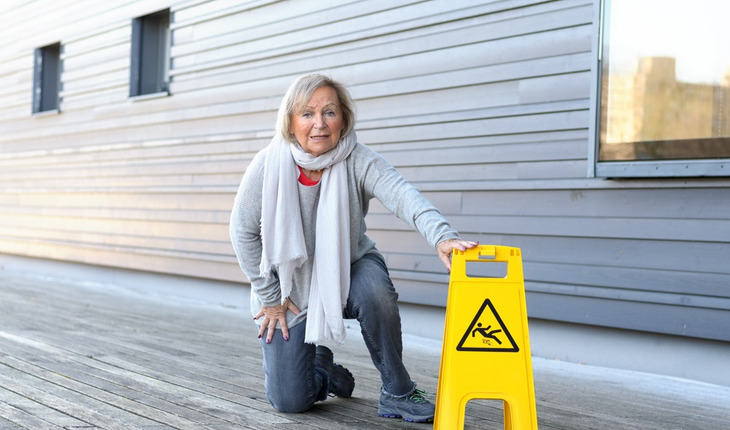 Poor eyesight, certain medications and even your diet, as well as the effects of arthritis, MS, Parkinson’s disease, Alzheimer’s, stroke and other medical conditions, can affect balance and coordination and lead to falls. See a physician if you experience any difficulties. For more information, visit http://www.kessler-rehab.com/.